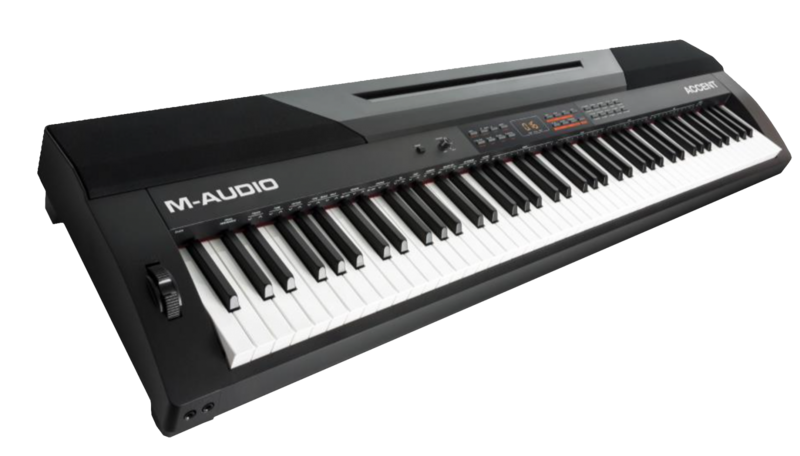 The M-Audio Accent is an 88-key digital piano designed for both personal and professional use. The piano features 20 different built-in sounds and plenty of adjustable features to make it truly versatile and adaptable for anything from piano lessons to studio and stage performance. This guide discusses some common questions about it's features and functionality. What is the size and weight of the Accent? What kind of sounds does it have? Does it have it's own speakers or do I need to provide my own? Can I use the keyboard with my Mac or PC? Does it require any drivers or setup procedure? The piano is playing the wrong notes. Is there a way to change the tuning? I want to return the piano to it's original settings. Is there a factory reset procedure? Yes, the Accent will come with it's own power supply, music stand, and sustain pedal. The Accent features 20 different classic voices including high quality Steinway piano samples from AIR Music Technology. The built-in voices include Grand Piano, Electric Piano, Drawbar Organ and many more (see chart below). It will also include 60 preset songs to play along to as well as accompanying patterns/rhythms in 50 different styles to fill in the left-hand rhythm while the user plays on the right. The Accent comes with it's own built in speakers, but offers options for the user to use their own speakers or headphones. The back of the Accent has both XLR and TRS balanced outputs for a high-quality, low noise signal, as well as two headphone outputs on the front. When headphones are plugged into the second headphone jack (Phones 2), this will also mute the internal speakers. If you turn the piano on and don't hear any sound, check to make sure that you're volume is at an appropriate level and you do not have headphones plugged into Phones 2. The Accent has a MIDI mode function to enable the 5-pin MIDI port on the back. Press Shift and the Demo/MIDI Mode Button to activate MIDI mode. The piano also has three assignable MIDI buttons available in MIDI mode that can be programmed to send control change, program/bank change, aftertouch and pitch bend messages. How do I record my performance on the keyboard? The accent features 5 spots for the user to record their performance directly onto the piano. Press the Record button to activate this mode and choose a free recording slot. Free slots will be labeled as nF1 - nF5 for New File #. Press the Record button again to enter recording standby mode and choose your voice, style or other desired parameters. Yes, the Accent can connect to a free USB port on your computer and will function as a standard MIDI controller to trigger software instruments and plugins in your favorite DAW. The piano is class-compliant and will not require any drivers. If you have any trouble connecting, please see our Troubleshooting Class Compliant USB Computer Peripherals guide. When using as a MIDI controller it's also important to note that the Accent should not be used as the input and output simultaneously. If the MIDI being sent from the piano is sent back to it through your DAW or other software, the piano will trigger to the incoming MIDI notes and begin to overlap the original sound. Yes, the tuning can be adjusted up or down by up to 100 cents (1 semitone), in 2 cent intervals (display will read up to 50 or -50). To do this, simply hold Shift and press the arrow keys labeled "Tune." To return the tuning directly to 00, simply hold Shift and hit both Tune keys at the same time. To turn Scale Mode on and off, simply hold Shift and press the Scale button. Hold Shift and press the keys labeled "Scale Type" to switch between different scales. To reset the keyboard to factory settings, simply hold down both the Yes and No buttons while powering on the piano. This will completely restore the system to it's factory settings and will permanently delete any recorded data.